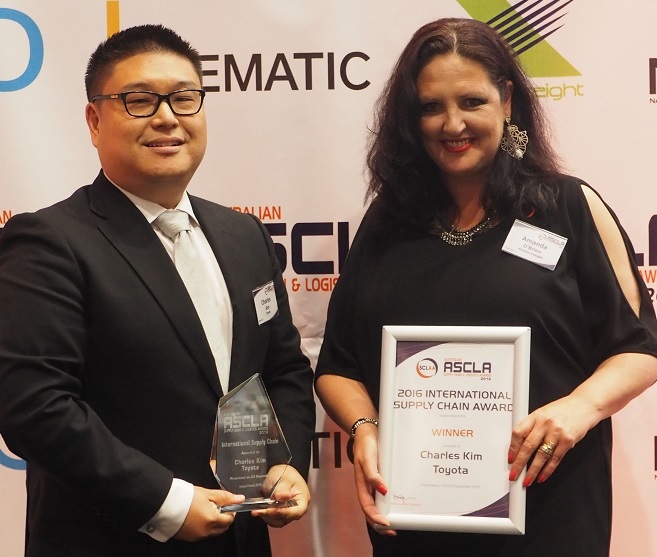 Since winning the ASCL International Supply Chain award at the 56th Annual Australian Supply Chain and Logistics Awards Gala Dinner in November last year, Siecap client Charles Kim of Toyota has received much deserved recognition from his colleagues, industry peers and global partners, along with an increase in visibility and the number of professionals wanting to connect with him. The ASCL International Supply Chain Award was given to Charles in his role as Manager of Supply Chain Kaizen & Systems, in the parts and accessories division at Toyota Motor Corporation Australia, as he has made significant achievements and has changed the way the Toyota Supply Chain has been managed and improved. He has demonstrated achieving closer relationships with global suppliers and has certainly increased recognition of the supply chain as an international industry. Toyota has begun emulating its Supply Chain Kaizen success with its worldwide family. Charles had already travelled to Toyota’s Japan headquarters to present the success of the project last year, and has recently returned from Thailand, where the success story was well received at Toyota’s global meeting; attracting many questions of interest afterwards. “Initially our kaizen activities were focused on Japan, but they will now be expanded to our distributors in Thailand and the USA”, said Mr Kim. When asked what his goals were for the year ahead, Charles shared that Toyota will cease manufacturing vehicles in Australia on 3rd October 2017 and will become a Sales and Distribution company. As a result, his main personal goal is to ensure that the organisation has a smooth and respectful transition. “I want to ensure that I leave the department in better shape than when I first inherited it and build capabilities in our team members to maximise their skills and assist in the next step of their careers”, he explained. As for Toyota, the company will continue to enhance their customer driven supply chain as they undertake cultural change within their organisation. “We would like to sustain our kaizen activities to ensure they do not deteriorate during our major period of change”, Charles said. Looking to the future, Charles see the key trends in the international supply chain community centring around increased customer demands, including reduced lead times and competitive pricing. He believes that partnering with suppliers to achieve common goals will be paramount in the modern landscape. Charles also predicts the continuation of technological disruption, with a big focus on Internet of Things (IoT); “it will be interesting to see how much influence this has over the next few years”, he said.